The Sunday Times Motor Show Live www.motorshowlive.com at the NEC, Birmingham opens to the public from 27th May to 6th June. Bentley: Arnage R and Arnage T facelift, Continental Coupe. Chrysler: NEW 300C, NEW £27,995 Crossfire roadster. Citroen: NEW C2 VTS, C2 GT, C3 XTR. FIAT: Trepiunto concept, Panda SUV, IDEA, Doblo high-top. Gibbs: Aquada amphibian + 7 seater V8 (demo in lake outside). Honda: HSC concept car (NSX replacement); IMAS hybrid. Land Rover: NEW Discovery III 7 seater. Lexus: NEW RX400h hybrid, IS200 facelift, LF-X concept. Mazda: New MX-Flexa (Mazda 4), Kusabi concept car. Mercedes: NEW McCaren Mercedes SLR. Nissan: NEW Nissan Murano SUV. Porsche: NEW £310,000 Carrera GT. Renault: NEW Modus, Megane 225, 7-seater Grand Scenic. Rolls Royce: NEW 100EX convertible. Suzuki: NEW Concept S, NEW Landbreeze concept, S-Ride concept. Top Gear stand: The Toyota Hi Lux they couldn't kill. Toyota: NEW 7-seater Corolla Verso, Corolla facelift. 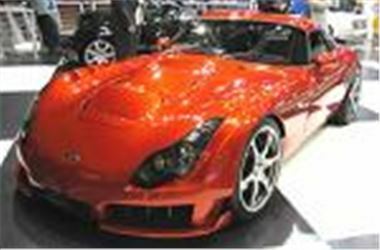 TVR: NEW Sagaris, NEW Typhon. VW: NEW Trek Polo soft-roader, Polo GT, Phaeton V10 diesel. Volvo: NEW V50, updated S60, V70, S80. No Alfas, no BMWs, no mainstream Mercedes, no Lamboghinis, no Protons. One of the new features of Motor Show Live is Taster Test Drive: a chance to test-drive cars as well as look at them. Cars available to drive are: Daihatsu Charade, Copen or Terios Sport; Honda Jazz, Civic or Civic IMA; Hyundai Getz, Matrix or Coupe; MG Rover 45, 75 Tourer, ZT or ZS 180; Nissan Micra; Subaru Impreza, Forester or Legacy, and Vauxhall new Astra or Meriva. Taster Test drives are accompanied by a co-driver on a specially designed outdoor circuit. They are free to holders of a general admission ticket and available on each day of the show. Visitors simply need to come with a valid drivers licence and head towards the booking area to register. Caterham Experience: Be driven for 3 laps around a spacial slalom circuit. BSM driving course for 14 - 17 year olds. Motropolis 'city of the future' display with Octane and Guru. Fantastic Thunderbirds feature in Ford Hall (Hall 4). The show is open to the public 28th May to 6th June. General admission is £16 (children/senior citizens £9). The public may also attend on Public Preview Day, Thursday 27th May. General admission is £40. Opening hours 9.00am to 7.00pm. Car Parks open from 7.30am. Parking costs £8.50 a day. Tuesday 25th and Wednesday 26th, Press Day and Business Day respectively, are not open to the public. For more information and to book tickets now, visit www.motorshowlive.com or phone 0870 730 2004.